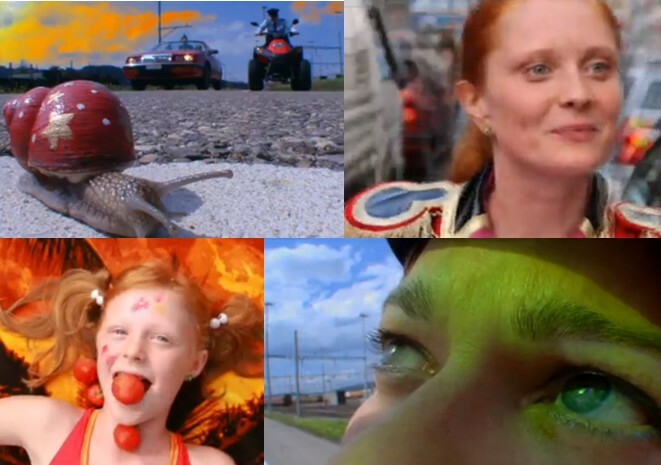 y first film of the Gothenburg International Film Festival 2011 was this colourful, exuberant and anarchistic story, the first full-length feature film by Swiss video artist Pipilotti Rist. A good film to start the festival with, as it happened, though (appropriately) that was a consequence of serendipity rather than forethought. The film tells the story of Pepperminta (Ewelina Guzik), who seems to be a combination of Alice from Wonderland and Dorothy from Oz, and who exists in time both as a young adult and as a child. (Her child self is played by Noemi Leonhardt). She lives partly in the real world, partly in a fantasy, but the two are not always separate. Pepperminta’s fantasy overlays reality like coloured plastic over the camera’s lens changes the colour of the world the lens sees. Pepperminta is on a quest to live without fear, to help everyone she comes in contact with to know themselves and achieve exactly what they “really, really, really want”. Along the way she gains champions and partners: the fat, shy Werwen (Sven Pippig), Edna NeinNeinNein Tulip (Sabine Timoteo), and the elderly Leopoldine (Elisabeth Orth) who is close to death. Pepperminta helps each of them to overcome their fears and they join her and become her followers and accomplices. The film makes great use of colour and perception, but also goes out of its way to focus on more senses than just sight: sound, touch, smell and taste also figure prominently. Special effects are generally of a more analogue than digital sort, for example, the stop motion sequences with strawberries or clothes, or the clever cutting in the “transporter” scenes when the characters travel to Pepperminta’s hideaway via her bath. Still, the production values are professional – this is video art for a cinema audience – and the film’s 80 minute running length does not seem too long. It is not the most intellectually challenging of films, and I suspect some people will be irritated by the adult Pepperminta in the first few scenes. However, if you can reach the Nirvana of suspended disbelief quickly enough I think the film will charm and delight. Unless you understand German, make sure you see a sub-titled version.